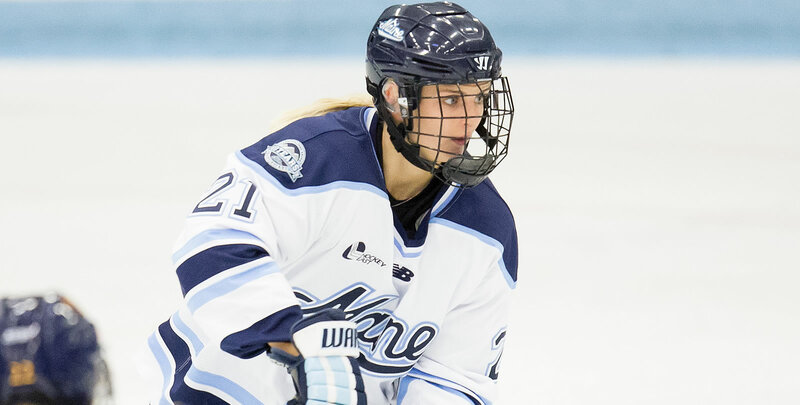 ORONO, Maine - The University of Maine women's ice hockey team defeated the Dartmouth College Big Green, 4-1, Sunday afternoon in the Alfond Arena to sweep the weekend. First goal (1-0 Maine): Celine Tedenby scored the lone goal of the first period only 3:20 into the frame. Vendula Pribylova, Tedenby's line mate, assisted on the Black Bears' scoring play. A quick change of possession caught the Dartmouth defense off their marks, which led to a good chance for Maine. Second goal (1-1): Alyssa Baker tied the game for Big Green with her first goal of the 2018-19 campaign. The senior took advantage of the power play and found the back of the net. Tess Bracken and Lotti Odnoga each assisted on the goal. Third goal (2-1 Maine): The Black Bears scored a power play goal of their own when Anna Zikova wired a shot past the Dartmouth goaltender. Zikova waited patiently for a pass from Michelle Weis, who was working the puck around the Big Green defense. The Cesky Tesin, Czech Republic native's second goal of the year gave Maine a 2-1 lead going into the second intermission. Fourth goal (3-1 Maine): Maine added to their lead when Tereza Vanisova fired and scored from the blue line. Dartmouth was called for a penalty, which freed up space in front of the Big Green net. Vanisova took advantage and scored her first goal of the afternoon. Fifth goal (4-1 Maine): Tereza Vanisova made a handful of perfectly timed moves to weave her way through the Dartmouth defense and eventually to the net. The Big Green netminder tried to stay in front, but Vanisova was too quick. The forward flipped the puck into the open net and gave her squad a commanding three goal lead. - Maine went 2-7 on the power play, while they killed five of Dartmouth's six chances. - Carly Jackson finished with 20 saves for the Black Bears. - Maine's defense also blocked 11 shots. Maine returns to the ice Friday, November 30th when they travel to Vermont to take on their Hockey East rival. Puck drop is scheduled for 2:00 pm.